In this Nov. 9, 2018, file photo money gets dropped into the kettle during the Annual Salvation Army Red Kettle fundraiser. Donations from businesses and individuals poured in after the apparent theft of the Christmas Eve kettle donations in Sanford. SANFORD, Maine — When Lt. Railene Griffin and Capt. Erin Smullen left the Salvation Army on Main Street on Christmas Eve, they felt relieved and accomplished. Earlier this season, they had set a goal of raising $45,000 through the Salvation Army’s annual red-kettle campaign. They reached that goal, thanks to the donations from customers who dropped coins and dollars into those kettles at Walmart, Shaw’s and Marden’s throughout the holiday season. In fact, they surpassed that goal and raised a bit north of $46,000. This is money the Salvation Army will use to help people in Sanford, Springvale, Shapleigh, Acton, Lyman, Alfred and Waterboro with their rent, utility bills, and groceries in the coming year. On Christmas Eve, Griffin and Smullen placed that day’s kettle-haul – $1,700 – in their safe, locked up the Salvation Army building, and headed home for the holiday. It was that day’s total that put them over the top of their goal of $45,000. And by the time Smullen reported to work on the day after Christmas, it was gone. Over the holiday, someone had forced entry into the Salvation Army, had broken into the safe, and had stolen that Christmas Eve sum. 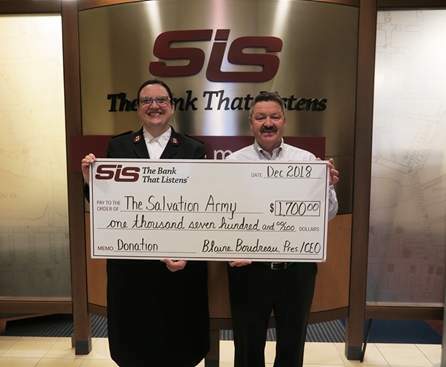 SIS Bank President Blaine Boudreau, right, ceremonially hands a giant check for $1,700 to Salvation Army Capt. 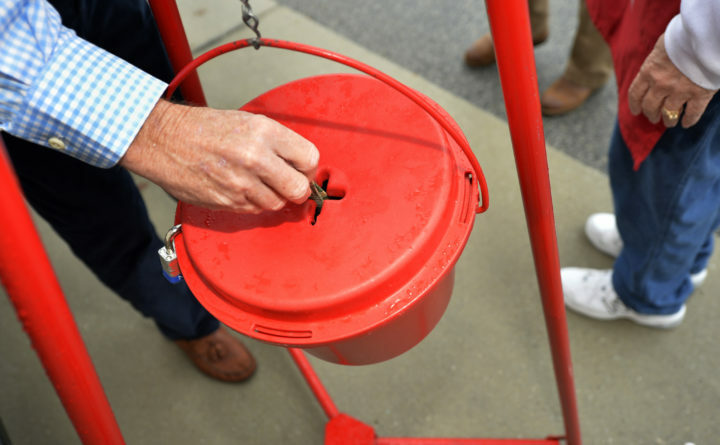 Erin C. Smullen to help the organization make up for the theft of kettle donation money in Sanford on Christmas Eve. Smullen called the Sanford Police Department right away, according to Griffin. Deputy Chief Timothy Strout, of the Sanford Police Department, reported that the call came in to dispatch on Wednesday, Dec. 26, at approximately 9:30 a.m. The investigation is ongoing, Strout said. Anyone with information regarding the burglary is urged to call the police department’s tip line at 207-324-9170, ext. 170. “It was a shot to the heart when I got the call,” Griffin said of the moment when Smullen contacted her with the bad news. Griffin’s heart would soon be warmed. As is often the case when such things happen, it takes just one Grinch to bring out the benevolent Whos. Once news of the burglary became public, the community started donating to the Salvation Army to help it recoup its loss. “The donations exceeded what was stolen,” Griffin reported on Tuesday. SIS Bank made sure of that – it donated $1,700. According to Griffin, two other local businesses also contributed to the generous tally – Central Furniture and Sanford Safe Storage. As well, individuals stopped by the Salvation Army and gave what they could – $10, in one case, for example, and sometimes more and sometimes less.